Joan Corbett joined the University of Canberra’s Faculty of Health in July 2011 to teach in the new Bachelor of Public Health program. Previously Joan worked for the Australian Government’s Department of Health and Ageing in Aboriginal and Torres Strait Islander Health and for 4 years led the branch with responsibility for the Pharmaceutical Benefits Scheme (PBS). In earlier stages of her 25 year career with the Australian Public Service Joan led teams working on various federal government programs including child care, disability employment service and family assistance. Joan’s varied work as a policy adviser and government program manager was informed by study in Economics and later in Public Policy (ANU). She was an Adviser on the staff of a federal Minister for Education, Employment and Training in the early 1990s learning a lot about the processes of Parliament and Government. 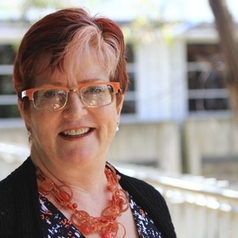 Joan holds a Graduate Diploma in Education (UC – then CCAE) and early in her career was a high school mathematics teacher. Governance and quality in health and community services. Joan is a Board Member of PANDSI, a Canberra based support and information service for Post and Ante Natal Depression.